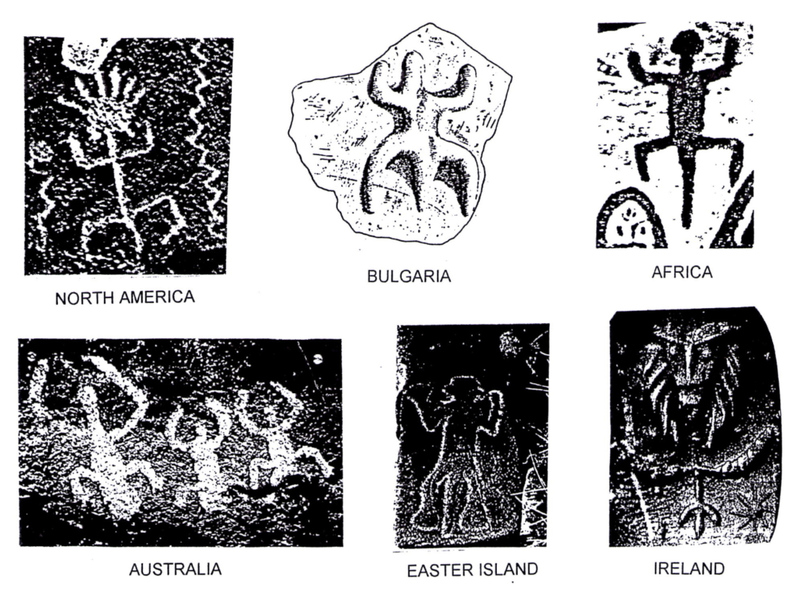 I believe the first human recorded evidence of that near past impact event is to be found in rock art, in various petroglyph forms found around the world. The rock art image below is probably one of the single most widespread rock art figure forms consistently found around the world. 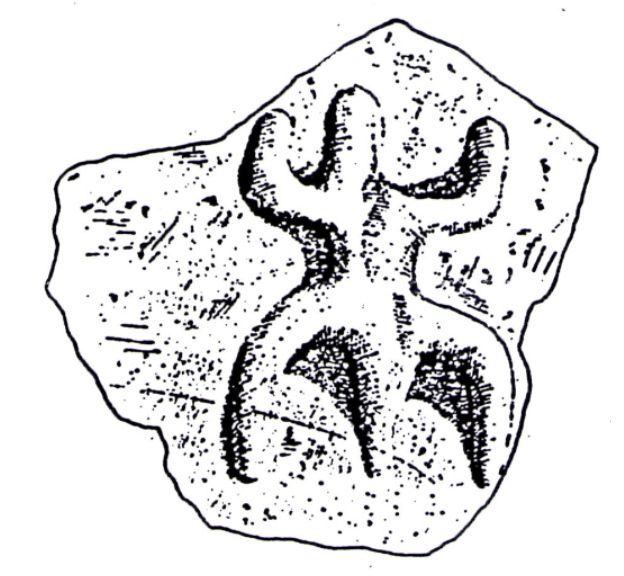 It looks like a human-like form with a head, a torso with upraised arms, bow-legs and a strangely overlong phallus and that it is a human form is how it is understandably currently interpreted by most commentators. Although human looking it is portrayed adopting a most unnatural stance. 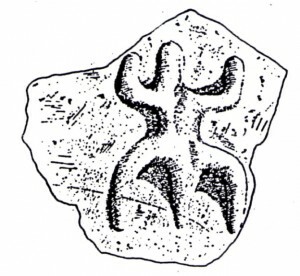 I would challenge the reader if he or she has ever seen anybody walk down the street in such a bow legged, upraised armed posture or even stand at rest in this unusual manner, so the question is why did ancient artists consistently portray the stance of this rock art figure form in this way? The fact that artists consistently drew this figure form with an extremely overlong phallus when there is no scientific evidence or historical record that the male phallus has ever been this long is another puzzling visual anomaly. The fact that this same image is found around the entire world presents the most puzzling anomaly of all. The question is how did ancient artists living continents apart from each other with no contact with each other come up with virtually the same artistic rendering of rock art depiction. I could understand if one or two artists on different continents happened to arrive at the same upraised armed, bow legged figure visual configuration and treat it as coincidence but to find the exact same image reproduced everywhere by artists around the globe is frankly beyond coincidence. It should not happen. Something, some overriding factor common to those disparate artists living continents apart obviously determined and prompted its origination. That something was I believe a large asteroid impact. With the first atom bomb detonations in 1945 mankind was able to view a very large explosion. The detonation of those first atomic bombs began with the appearance of a dome like structure. This was an effect of the explosion called a Wilson cloud. 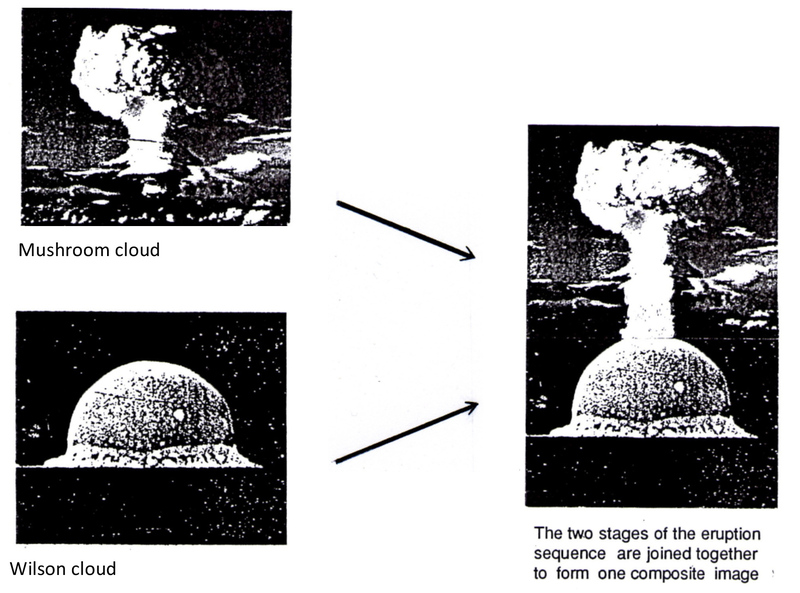 The leading detonation shock wave causes the air in front of it to momentarily cool causing the air to condensate and mist forming a dome shape around the initial detonation. The explosion fireball then rose up through the Wilson cloud structure, which then dissipated from sight, within the familiar mushroom cloud canopy leaving a column of smoke in its upward wake. I am of the opinion that the same visual sequence of a detonation, eruption spectacle occurred at that past asteroid impact event. That the impact detonation began with an immense Wilson cloud , a huge dome structure appeared at that past ocean impact site and a gigantic mushroom cloud canopy then subsequently rose into the air atop a column of smoke. Such an explosive spectacle was obviously one of unfolding movement. I believe primitive ancient artists in an attempt to capture the unfolding movement of the eruption spectacle combined the two main explosive sequences, the initial Wilson cloud form and then the subsequent mushroom cloud eruption form into one artwork representation to visually show in one graphic depiction the sequence of explosion in its entirety.